I have never owned a lot of jewelry because I have trouble finding pieces that I really like, and I don’t like to spend a fortune on jewelry that I may wear once or twice. I want something that I can wear to a meeting or a party. I need jewelry that works with cocktail dresses and cotton tops. I am a Mom that likes to be comfortable, but I also attend several events and dinners and want to look nice. I was recently sent two pieces from Mialisia Canada that meet all of these needs. 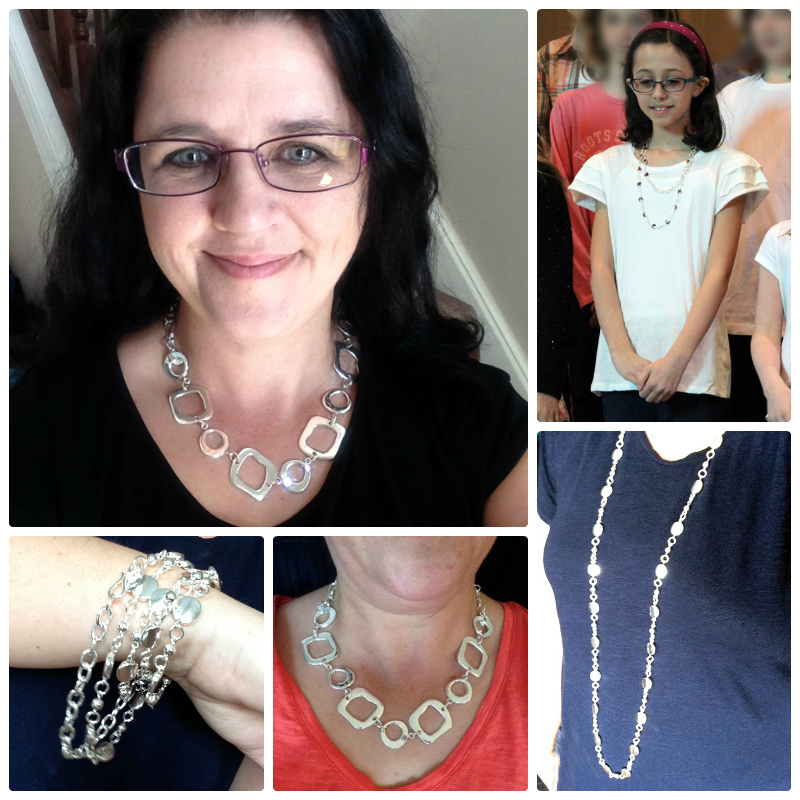 The “Primary Shapes” and “Spun Sugar” necklaces are from “The Simply Silver” collection and I feel like they were made just for me. The Primary Shapes looks fabulous with a straight or rounded neckline, and I love it with any outfit. It is 19″ long which is a perfect length for me, and it can also be joined to another Mialisia Canada piece to give a whole different look. Avery was the first to try the Spun Sugar piece. She doubled it up and wore to a choir performance and it looked beautiful on her. I really like this piece because it can be worn long, doubled to look like two necklaces or wrapped around the wrist as a bracelet. The versatility of these pieces is ideal for someone like me, and it can be used as belts, hair accessories and more. Take a look at some of the ways it can be worn in this short video. It also makes a great hair accessory! Mialisia goes beyond just being a company with beautiful and versatile jewelry. The company was started by a stay at home Mom who created the jewelry herself and started selling at craft shows. I love stories about women who have found their creative outlet and turned it into a business. You can watch her whole story in the short video below. Mialisia has grown into a thriving business that allows women to become their own bosses and start their journey toward a better life for themselves and their family. You can learn more about joining the Mialisia team on their website. One of my lucky readers will win a Spun Sugar necklace of their own! I like the Blue Taffy necklace! My favorite pieces are the BLUE TAFFY necklace and the OPTIMISTIC ring. I love the sugar and spice necklace! Simple yet so colourful! Oooohhh. I liked a bunch but I love the Cleopatra! I love the Carolina earrings! I like the Lazy Daisy necklace. I like the Optimistic ring. I adore the FILIGREE earrings. My favourite piece is the LOVE STRUCK necklace! They have some great pieces! I love the Capri earrings. I like the LYRA SKU: 12-0053. You could do so much with it. I love FANCY NANCY it’s so pretty! Oh I just adore the “Sweet Love” earrings! I really like the Sugar and Spice necklace! The Love Struck necklace is very nice. I like the Central Park ring. I like the Posh necklace a lot. I love the Julie Tuesday. I really like the Optimistic amber ring. Beautiful! I like the amber ring. I like the silver hoop earrings. The BLUE TAFFY necklace is really pretty! Love your stuff. The posh necklace is beautiful. I love the times square necklace! NAPOLI – SKU: 30-0016 – Antique Silver with pearl. I love the Tifton Ring. The Madison necklace looks nice. I like the ALEXANDRIA necklace. I really like the CLEARLY CLASSIC necklace…I could wear it with anything! It looks like they have some nice styled jewelry. I’ll have to check them out. I love the Orion ring. I love the blue taffy necklace just my colour. I like these earrings: GLOWING (SKU: 20-0019). I really like the blue taffy necklace. I really like the Blue Taffy! Madison and Summer Days are two of my favorites! I guess it’s a tie for me? I like both the POSH and the CLEOPATRA Necklaces,just about the same! I love the Blue Taffy necklace! I love Perfect Circle – VersaStyle. So many other great pieces too.